So that's where I'm going on vacation. All week long, friends and co-workers have been asking me, "so where are you going?" "Somewhere in Southern California ... near L.A. ... (trailing off.)" You don't know where you're going?" Um, no ... it's a family vacation. My parents planned it ... (trailing off.)" But in a way, that's what this vacation is pretty much about. Being 7 years old again ... for all of the good and the bad of it. Today we set up on the beach and I actually went boogie boarding. I never saw much point to it before, but it is pretty fun. A couple of times I tried to paddle under the crest of the wave, like surfers do on TV, riding out that beautiful curve until it meets its natural conclusion. It didn't quite work that way for me. It was more like an underwater thrashing while the breaking water dragged me over a lot of abrasive sand. Even more fun was fighting the crazy tidal current as it dragged us out to sea. I put on two different coats of SPF 50 and I still have a couple of burn patches on my back and legs. I think I'm blinding all of these beautiful Californians with my previously unexposed areas of pasty Alaskan skin. My dad and I found a whole pile of beach cruisers in a garage at this condo we're staying in. Only three were semi-workable, and even then just barely. I don't think I'd ever get much of a workout spinning a clankety single-speed at 9 mph along a crowded bike path, but I suppose it's better than nothing. I didn't find much in the way of bicycle rentals in this area. I'll have to fan out my search area on Monday. I don't really know how far out of town I'm going to be able to get. 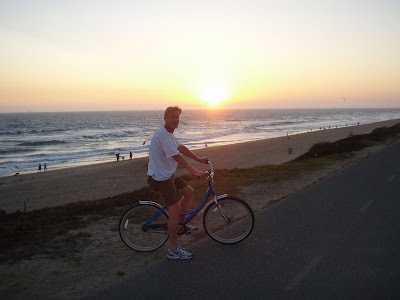 If anyone near Huntington Beach has a working bike they wouldn't mind renting to me, for compensation of course, for a week ... maybe you could send me your contact info to jillhomer66@hotmail.com. Anything would be much appreciated! Enjoy, enjoy, enjoy, you've earned it. Anza Borrego Desert State Park is remarkable. It's just east of San Diego if you get the chance. Beach cruisers are fun if you can get a good one that fits. Boogie boards are fun but I love just plain old body surfing. It's amazing how far you can ride a wave with just your body. I bet there are some great places to eat around there too. I've never been to Anza Borrego SP but I have no doubt Vito is right that it's remarkable. I have spent a few months time hanging in Joshua Tree however. Very cool National Park. It's about 3 hrs. inland from where you are so I guess that's a pretty long day trip. Have a great vacation Jill. It sounds like you're enjoying it for what it is. May you fully reach the mode before it's over. If you find yourself resting too much, drive up Hwy 1 to Monterey. Rent a Mtn Bike from Jocelyn's. Then take it our to the back side of Fort Ord, home of the Sea Otter Classic. Park at the Toro Creek Road Trailhead and start your ride by climbing up Guidotti Rd. You'll be riding the giant downhill course in reverse, so you should get a great warmup. From there, you can ride through just about anything you desire--except snow. A map of all the trails can be found at http://www.blm.gov/pgdata/etc/medialib/blm/ca/pdf/hollister.Par.64029.File.dat/current_version_trail_map.pdf. H.B. my old stomping ground. It is very beautiful there. Just be careful the water is pretty bad. A couple years ago they found syringes and other needles in the water from hospitals. Otherwise, it sounds like the fabulous beach cruisers are your new ride. Go eat at Duke's, it's amazing!!! Sunset beach down the road is also spectacular and I hope you check out the new and improved downtown Long BEach, lots of great shops and food. I'll bet people note the strong family resemblance between you and your dad all the time, right? Just up the road from the Pier in Huntington Beach is the Sugar Shack. Go, eat breakfast, and be happy. Seriously. Give in to the good life. i suggestthe avocadoes. Best of luck for your vacation trip, I'm so happy for you.